I am working on a plan for someone, as well as my eBook’s that I have going on. While I am working on these things, here are a few tips and suggestions I have in both the eBook as well as workout plans. This is for those doing heavy lifting and following the IIFYM lifestyle that I firmly believe in. You may benefit from this as well! Plus this gives you a taste for how I do my writings/plans/ebooks! Enjoy and happy lifting/eating/living! Always stretch after your workout. You should stretch after your muscles are used and blood has pumped and heart has elevated. Otherwise, you are more prone to injuries and tearing/straying a muscle. Stretch after the workout to prevent soreness and prevent injuries from the workout you just completed. More flexibility=more range of motion=less injuries and strains. On days with cardio, you should do HIIT cardio. You will choose the style of cardio you wish to do and complete 15 to 20 rounds of intervals, doing 30 seconds of all out sprinting (going as hard and fast as you possibly can) and then 30 seconds of walking/resting (going very light). HIIT style burns more fat, boosts the metabolism and has longer lasting effects even after the gym versus standard cardio. It also keeps your body guessing to prevent plateaus after some time of working out. Consume BCAAs/glutamine and your protein ASAP. Protein can be in shake form, bar form, or whole foods (chicken, tuna, etc.). Also have carbs and sugars (I love greek yogurt with fruit, PB & J on either a rice cake or flat bread/english muffin, etc). KEEP UP WITH MACROS. DO NOT ADD IN YOUR WORKOUT/CALORIES BURNED. On MyFitness Pal, you can put in your workout and it’ll subtract that calorie burn from your total calories for the day. Please do not factor in the workout. The calorie goal for the day for you has been set, even with workouts. If you are to consume 2500 calories, consume 2500 calories on rest days, AND workout days. Even if you burn 800 calories, you will not eat 3300 calories to make up for the gym. It defeats the purpose of your plan. Try to plan your day, but you do not have to do it a week or even 24 hours ahead of time. But with IIFYM, it’s best to go ahead and juggle your macros and what you can play with according to cravings ahead of time to ensure you eat more protein/less fat/more carbs etc. I start by eating my breakfast (whatever I want that morning) and input it. I then try to balance my day after. Breakfast is where I really go all out usually. If I know I want to incorporate 2 Oreo’s after dinner, I input it and figure out where I can make up more protein. You can delete what you enter into the app easily to play around with what you can do before you go messing your macros up. IF YOU CRAVE SOMETHING, PLEASE EAT IT. If you have craved Cheetos for 2 days straight, you are better off just eating a handful of Cheetos (or a small bag) and getting it over with rather than letting your cravings build up and then binging on 8000 calories of bad foods. That 300 calories Cheeto bag is much better than the 8000 calorie binge (plus the guilt during/after and feeling beyond fluffy for a week). If you are craving something terribly, please consume it, even if it doesn’t fit your macros. It will save you in the long run. My Fitness Pal has been around for a while now. It’s an easy app you can download on any smart phone (Windows/Apple/Android) and you can keep up with your food and drink intake at the touch of a button. You can manually enter the food or you can now even scan barcodes and the app will load the information for you. Most foods are already plugged in and all you have to do is search for it, find it, and enter how much of it you had. Super simple. Studies have shown for many years that having and keeping a record of you food intakes (a food diary/journal/daily log) does significantly help with changing eating habits, whether it’s losing weight, gaining, becoming healthier and so on. My Fitness Pal is extremely easy and since it is in app form (with a login) you can access it from all your mobile devices and even from your computer. You really have no excuse to not be able to record everything you eat, as you eat it. I know it can become tedious having to enter in everything you put your mouth, but it helps you realize what you really are eating every day. A lot of people when asked how many calories/fat/protein/etc was in something they just ate, they weren’t even close to the real numbers. You should know what you are eating. You should know the reality that most people do not actually eat the serving size recommended and listed on the nutrition facts for most foods. You are probably eating twice that amount unless you actually go around measuring your food. Measure your food and plug into the app BEFORE you eat it, so you can really see what is going into your body. If it is 3000 calories and has 500 g of fat, I don’t care who you are, you’ll probably think ‘well, I probably shouldn’t actually eat this’. This is good way to handle binges/mindless snacking and so on. If you see the damage before you ever even do it, you’ll think twice about it. You also are probably guessing your calorie amount and how much you really eat on a daily basis and are probably off by a lot. Most people who are overweight do not realize how much they are actually eating. It’s like a denial type of thing your mind does. By recording your daily intake, you can hold yourself accountable and also notice where you need to make your changes. You don’t have to be on the macros counting diet, IIFYM, nor do you have to be counting calories for a food diary to help you reach your goals. I would suggest you try the macros counting if you do want results and without depriving yourself, but to each their own. A food diary will make you aware of your daily habits and since you can even add friends and they can see your daily log, too, it holds you accountable. You can even share when you reach goals on social media sites if you so choose. These sorts of things tend to help motivate more than just trying to diet and keeping it all to yourself. It’s a proven fact that social support is in fact a big factor when it comes to being successful and sticking to a workout routine or diet. With My Fitness Pal, it’s pretty simple and user friendly. Simply plug in your foods, you can even try and plan ahead by entering foods you think you may eat and seeing how your macros or calories come out if you are a counter. 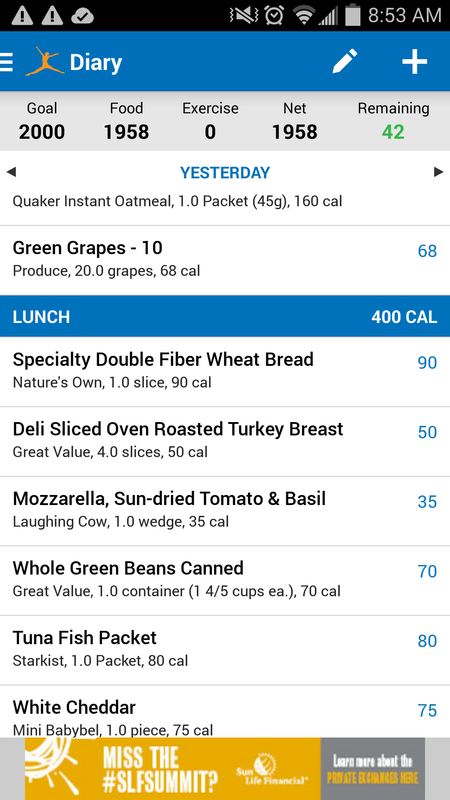 You can view your nutritional values for each food as well totals for your whole day. You can view it in list view and also as a pie chart. 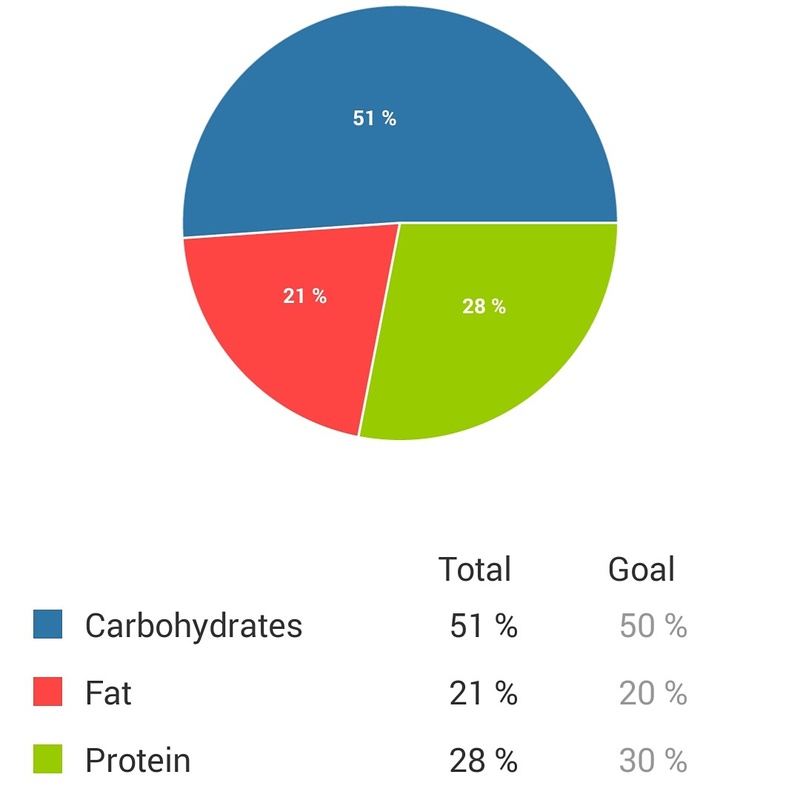 If you are a macro counter, you can set your goals for macros (carbs, fats, protein) and look at your pie chart to see where you are for the day. I honestly don’t know what I would do without My Fitness Pal. Now I am not saying be strict everyday and I am certainly not saying you don’t get to have treats every now and then without recording them. I do. So you can too. But once you get in the habit of plugging in your food and what a good day looks like and have done it for a while, you get the general idea of how you should eat and what to eat without having to be so strict with plugging it in. And that cheat meal? Don’t even worry about plugging it in. If you do, you’ll feel really guilty probably, and nobody’s got time for that. Let me know if you try My Fitness Pal! Add me if you want to!